I have heard a few folks talk about fasting and intermittent fasting and the pros and cons, so I am writing this post to share my own thoughts. I will start out by saying that I wasn’t able to find a significant amount of conclusive clinical studies about fasting and its impact on fertility, in either men or women. For those who have read my previous posts, you know that I am a stickler about health and wellness, and particularly how consuming a nutrient dense diet is just one critical component of your fertility journey when TTC, and I will continue to emphasize this point. There are many kinds of fasts; some of them are based on spiritual practices and can strengthen your spiritual foundation. Depending on the type of fast you are undertaking, it is super important to get adequate calories and nutrients from healthy fats, plenty of proteins and vitamins and also continue to hydrate with tons of water. 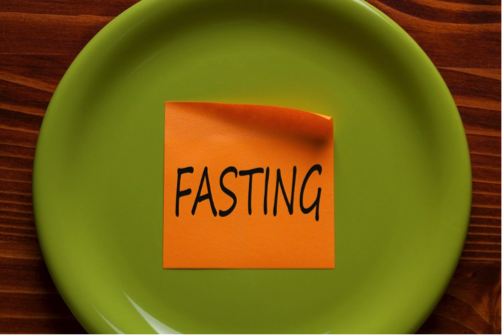 Fasting does offer benefits, such as reducing inflammation in your body and detoxing your digestive system. Keep in mind that our bodies require a lot of energy and when fasting, you are creating calorie deficits which can divert much needed energy from essential bodily functions. This is a very critical point – during this time of fasting – your body shouldn’t have to wonder about food availability. You want it to continue to have the energy to produce necessary reproductive hormones of estrogen, luteinizing hormone, and follicle-stimulating hormone as well as progesterone. An important part of that process is caloric intake, and nutrient and vitamin consumption. So when fasting, you will want to ensure that you are getting what you need so as to not negatively impact hormone production and balancing. If any hormone is off balance, then conception is much harder and almost impossible to achieve. There could be other alternatives to fasting that are better on your body during this critical time of TTC, such as doing a short term cleansing. Now this is off the realm of food, but I would urge you to not only think in terms of food and drink, but also other worldly consumption – internet, social media, anything with an ‘addictive’ ability can be used as a form of a fast. So for example, if you spend a lot of time on social media, consider stepping away from it for a few days or weeks. Similarly, if you are constantly connected to your cell phone, consider unplugging for a while. As I said earlier, fasting in and of itself is a form of sacrifice. Thinking about all of things that you can go without for a period of time is a form of sacrifice, especially during the busy holiday season. Whether you decide to fast from food or other things, fasting can be a great opportunity for you to embark on a period of renewing your mind, body and spirit while you are on this journey of TTC. Just remember what your body needs most, and do what you can to ensure that you are eating your best, being your best and doing your best ! Love and many hugs to you !